BEST Fathead Pizza Crust Recipe! 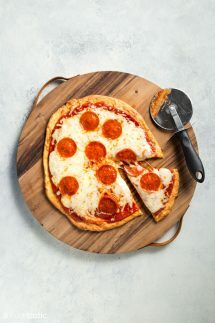 Fathead Pizza has been on our menu since I discovered it last year, my kids make it almost weekly as it’s so easy. The taste and texture from a basic mixture of cheese, eggs and low carb flour is mind blowing because of how closely it resembles real bread pizza dough, but minus most of the carbs of course. If you’re wondering “what is Fathead Pizza?” then you’re not alone. It’s not been around that long and first burst onto the scene in 2009 via the Fat Head documentary movie where the director sets about refuting the ‘lipid hypothesis’ first made popular by Ancel Keys back in the 1950’s. 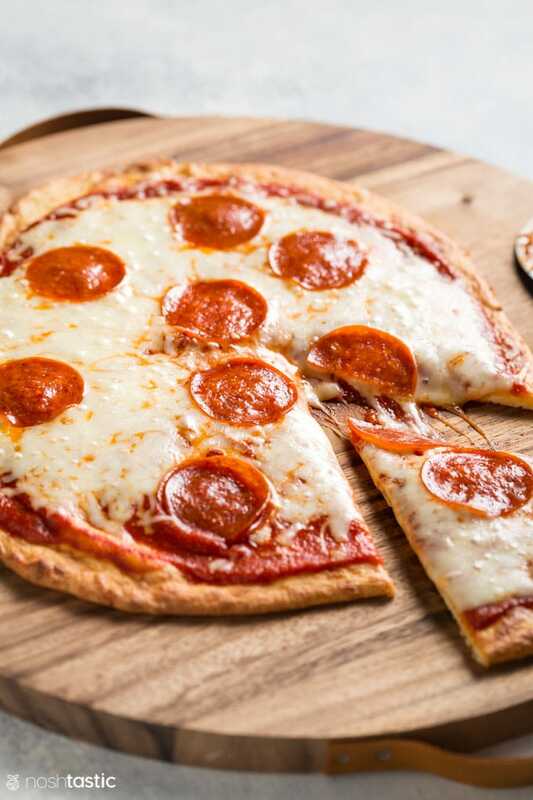 My fathead pizza crust recipe has been tested several times both with almond flour for one version, and then coconut flour for the other version so that you have options if for whatever reason you can have one flour but not the other. 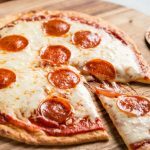 How to make Fathead Pizza Crust – Almond Flour and Coconut Flour options! Start by measuring out your chosen flour, almond or coconut, then preheat your oven so you are ready to cook your keto pizza as soon as it’s rolled out. Then add the garlic powder if you are using that to your chosen fathead pizza dough flour. We are not adding salt simply because the cheese is plenty salty enough. Measure out the egg or eggs (you will need one egg for the almond flour fathead crust, and two eggs for the coconut flour fathead crust.) Coconut flour is very high in fiber and it needs more liquid than other flours. Beat the egg with a fork so you are ready to add it to the cheese in the next step. 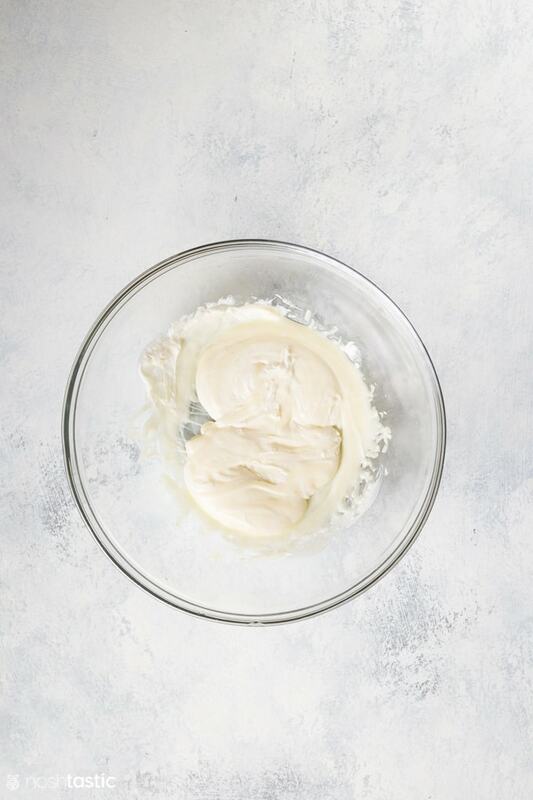 Measure out the mozarella and cream cheese in a microwave safe bowl and microwave on high for about 45 seconds to one minute, this time will vary depending on the wattage of your microwave. Remove the cheese from the microwave and give it a stir then put it back in the microwave for a further 20-30 second burst. It should end up looking like the melted cheese you see in the photo below. not separated and oily, but hot, sticky, and the mozzarella will be somewhat stretchy. 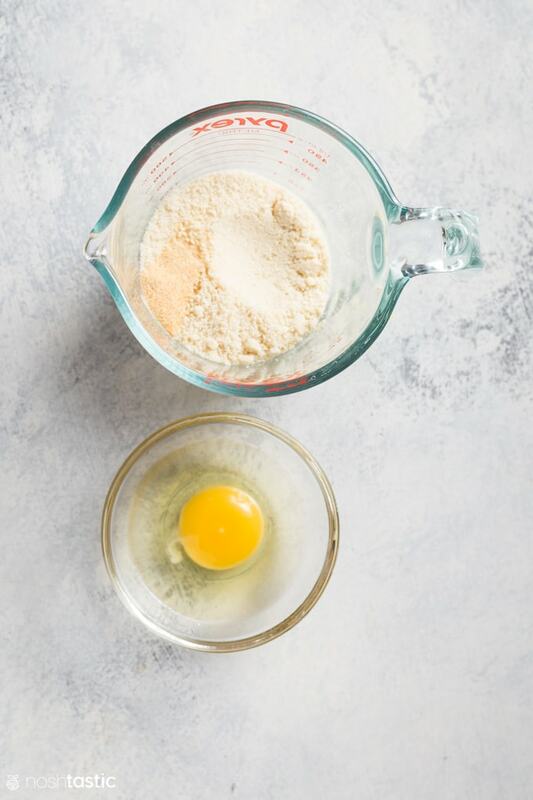 Combine your chosen low carb flour, and garlic powder with the beaten eggs and melted cheeses and mix together using a fork until you get a dough forming, this should not take too long. We tested both the almond flour fathead pizza dough, and the coconut flour fathead pizza dough. The coconut flour keto pizza dough was a good deal stickier but it still worked equally well and cooked up a treat. Next, you’ll need to roll out your fathead pizza dough. I found that that the easiest way to do this was between two sheets of parchment paper and then simply lift the parchment with the rolled out fathead pizza crust onto the sheet pan like you see below. Once you’ve rolled out your low carb pizza crust you’ll need to poke some holes in the top with a fork, this will help prevent it from forming large bubbles on the surface. Then, you can go ahead and bake it for about 12 – 14 minutes in your preheated oven, see the recipe card for complete details as the exact timing may vary. What Keto Toppings Can I add to my Fathead Pizza Crust? For our fathead pizza we kept it simple by first topping it with my homemade Keto Low Carb Marinara Sauce which doesn’t take long to make. If you don’t have the time or the inclination to make your own marinara sauce you can opt for one of the many ready made low carb and sugar-free marinara sauces on the market instead. Then we simply added more cheese to our fathead pizza crust (can you ever have too much cheese??!) and topped it off with some pepperoni. If you don’t want pepperoni you could add any other meat you prefer, ground sausage is a great option, but don’t forget to cook it first before adding it to your pizza. Then you can choose from a variety of low carb vegetables such as asparagus, bell peppers, a little onion (not low carb but ok in moderation) or shredded cabbage, chopped green beans, which are not your typical pizza toppings but they works for me! How many Carbs are in Fathead Pizza Crust? Fathead pizza crust made with almond flour has 3g net carbs per serving. This amount of low carb pizza dough makes enough for 6 average slices, the macros listed in the nutrition label are for the almond flour fathead pizza crust only. If you opt to make your fathead pizza crust with coconut flour then that will lower the carb count further. It makes more or less the same amount of keto pizza crust as the almond flour version. And, as coconut flour is very high in fiber the end result is that the net carb count is a bit lower coming in at around 2g net carbs per slice, so this would be the lower carb option of the two. 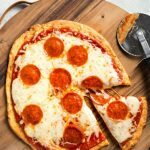 Fathead Pizza crust recipe that's so easy and tastes like the real thing! 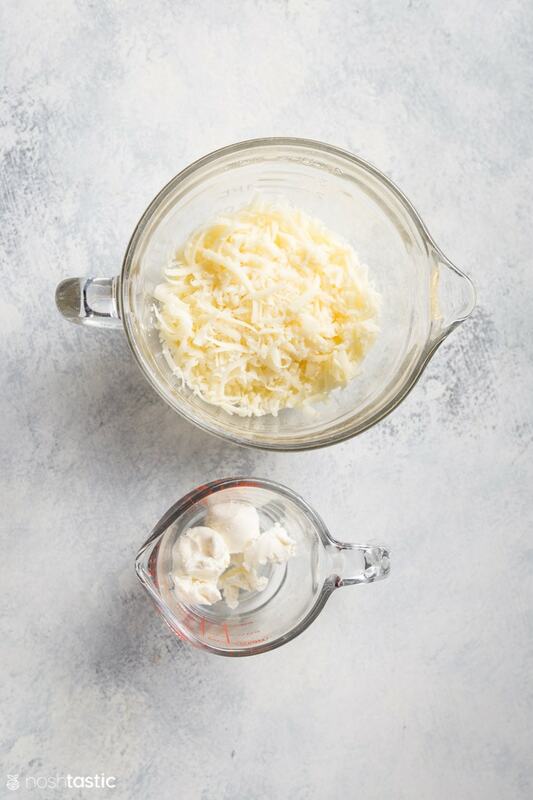 Mix the mozzarella and cream cheese in a microwave safe bowl and microwave on high for one minute and stir well. Microwave for a further 30 seconds and stir well again. Add the almond flour, garlic powder, and eggs and mix well until a dough forms. 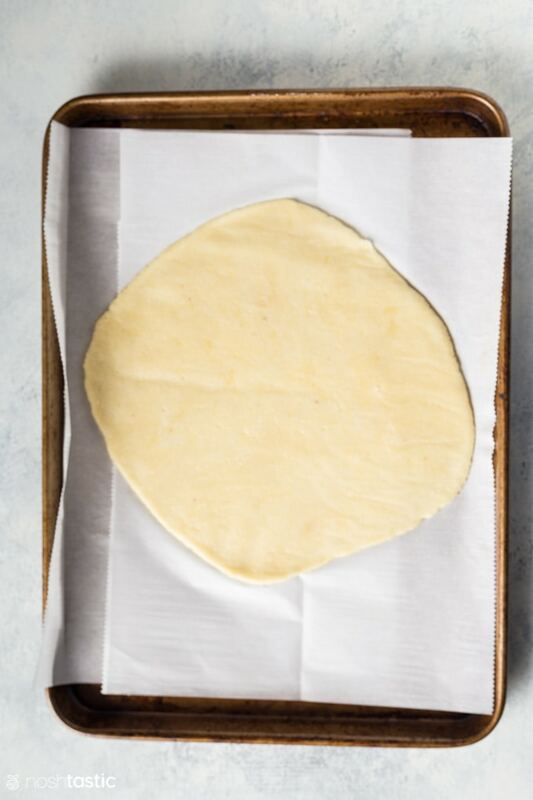 Place the fathead pizza dough between two pieces of parchment and roll to about 1/8" thick and into your desired shape for your pizza crust, then lift it onto a sheet pan or cookie sheet. Using a fork, poke holes in the top of the rolled out pizza crust, this will help prevent bubbles forming. Bake for about 7 minutes then turn the pizza base over and cook for 5-7 more minutes. Remove from oven and add your favorite low carb or keto pizza toppings, then return to the oven for 5 minutes to heat the toppings. Follow the directions above for melting and mixing the cheese in the microwave. 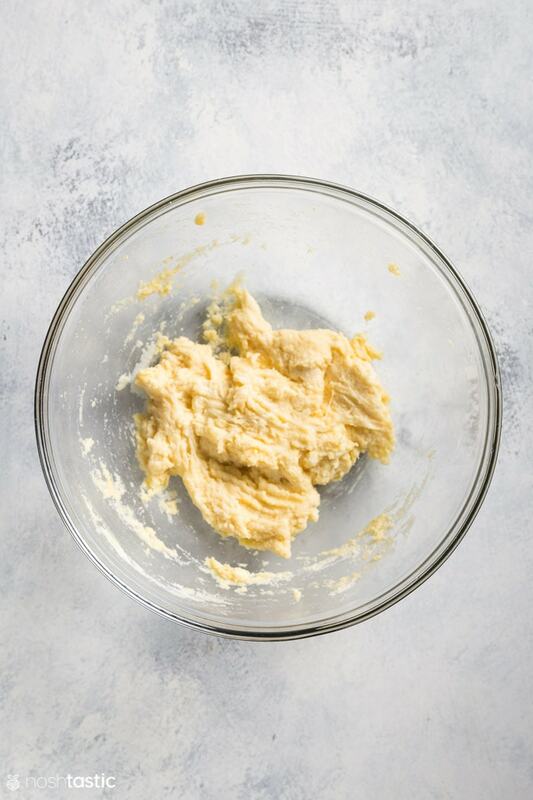 Add the coconut flour instead of almond flour, garlic powder if you are using it, and then two eggs (the almond flour version only has one egg) and mix well until a dough forms. We found the coconut flour fathead pizza dough to be a little more sticky than the almond flour version but that's ok and it works just as well. Follow the same directions above for rolling out and baking your pizza crust, the time it takes to bake may be a little less than the almond flour but will depend on how thin you roll it and the temperature of your oven. Macros listed in the nutrition label are for the almond flour version only, it will be different if you use coconut flour and the net carbs will drop from 3g per serving to 2g per serving.